Saying goodbye is never easy. 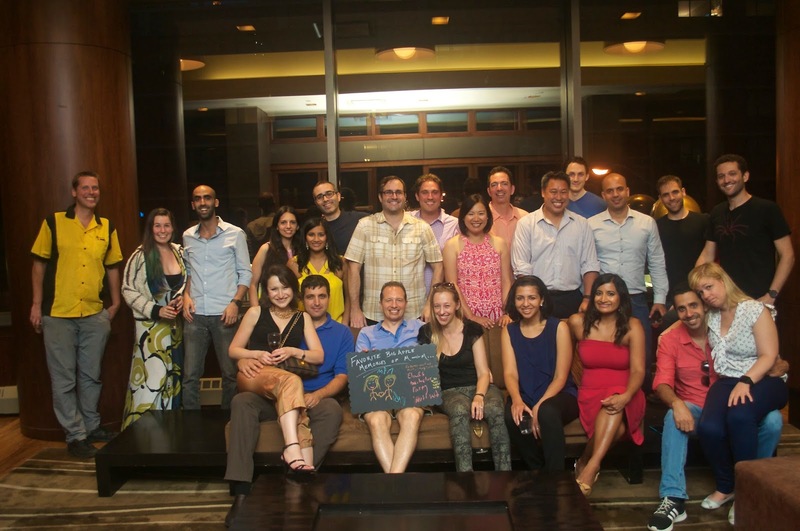 But we can lift everyone’s spirits with an AMAZING bon voyage party! My college roomie, Michaella, was bidding adieu to New York after 16 years!!! 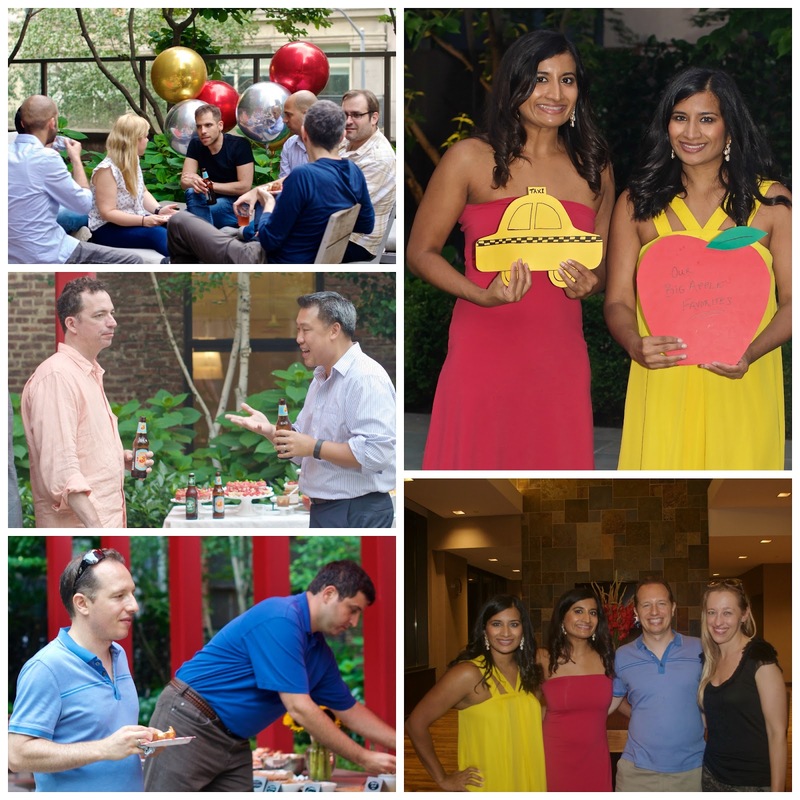 Since she and her husband, Matt, were moving to Minneapolis, I suggested a BIG APPLE to the MINNEAPPLE themed farewell party (in case you didn’t know, Minneapolis is nicknamed the “Minneapple”). She LOVED the idea. She hosted a beautiful party and I’m very excited to share it with you! Michaella is an event producer at Lucent Projects. We had a lot of fun brainstorming Big Apple and “Mini” Apple ideas. She captured the spirt of New York City through a red, yellow and black color palette. Archana and I loved the little accents she incorporated. She designed her own red apple and yellow taxi cutouts to represent New York City on her buffet table and bar. 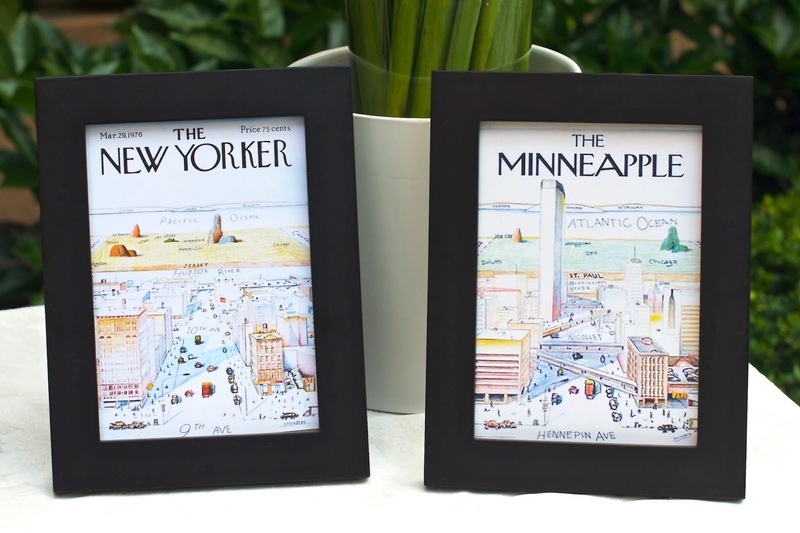 My favorite was definitely the framed posters of Paul Steinberg’s famous cover of the New Yorker and its spoof dubbed the Minneapple. Michaella hung a “Thanks for the Memories” banner above the buffet. Banners are great decorative pieces- they can also frame a space well. Michaella said this banner was incredibly easy to put together: triangle pennants from Paper Source, baker’s string and silver letter stickers from Michaels. Archana and I have created similar banners from scratch with cardstock, stampers, printed letters and ribbon. I must warn you, a DIY banner is VERY time-consuming. You can also purchase some from Etsy but the banners on the site can run you over $50. I love incorporating flowers to add pops of color to a space. 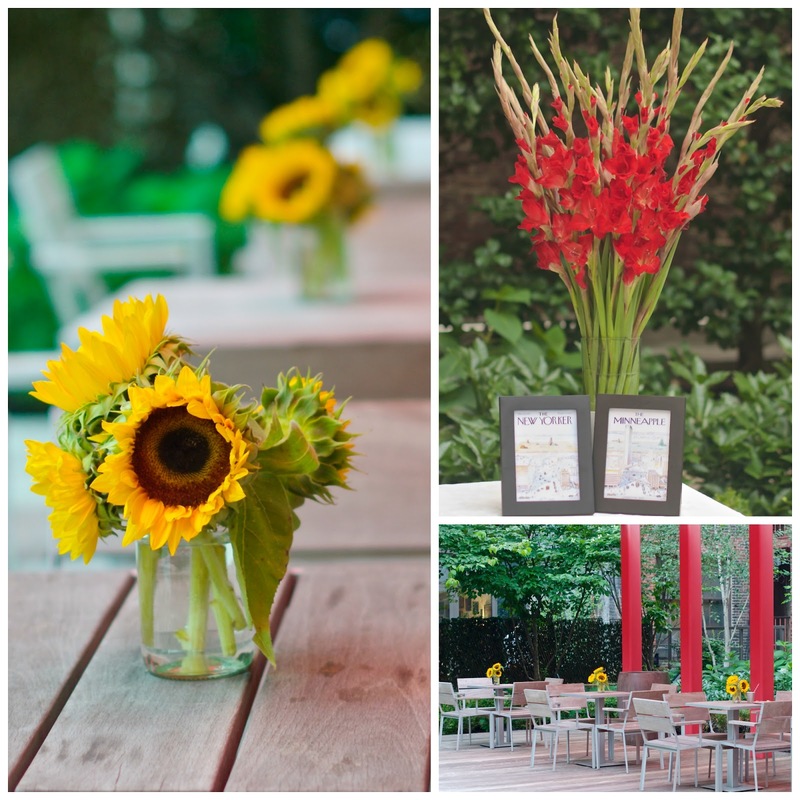 Michaella used gladiolus and sunflowers to continue her red and yellow color scheme. She used mason jars as vases. Ballon Saloon created a red, golden yellow and silver mylar balloon bouquet. 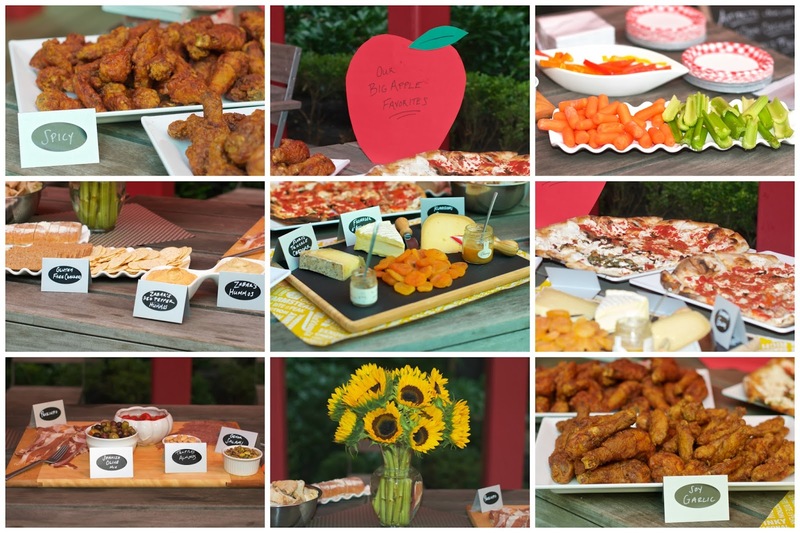 The menu featured some of Michaella and Matt’s “Big Apple” favorites: Grimaldi’s Pizza, BonChon’s spicy and soy garlic chicken wings, hummus from Zabar’s, selections from Murray’s Cheese and Ottomanelli’s Meats and assorted breads and crackers. 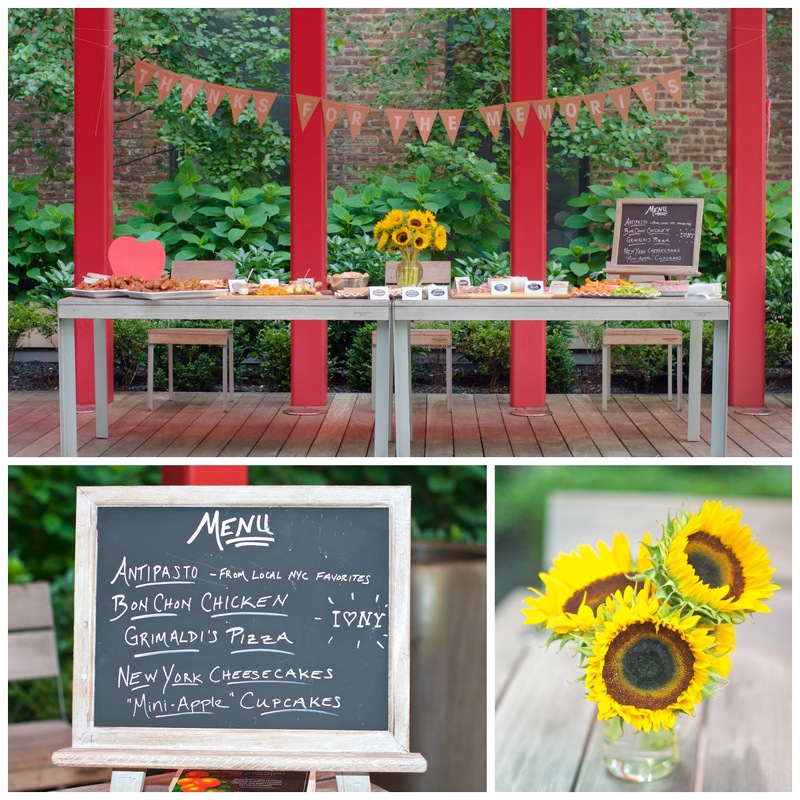 Michaella used an adorable chalkboard easel to display her New York themed menu and chalkboard food labels. She found these items at Michaels. Baked By Archana created the scrumptious Big Apple and “Mini” Apple themed desserts: New York cheesecakes with a strawberry topping and mini apple pie cupcakes with buttercream frosting. To round out the themed desserts, Michaella served apple slices with a yummy caramel dipping sauce. 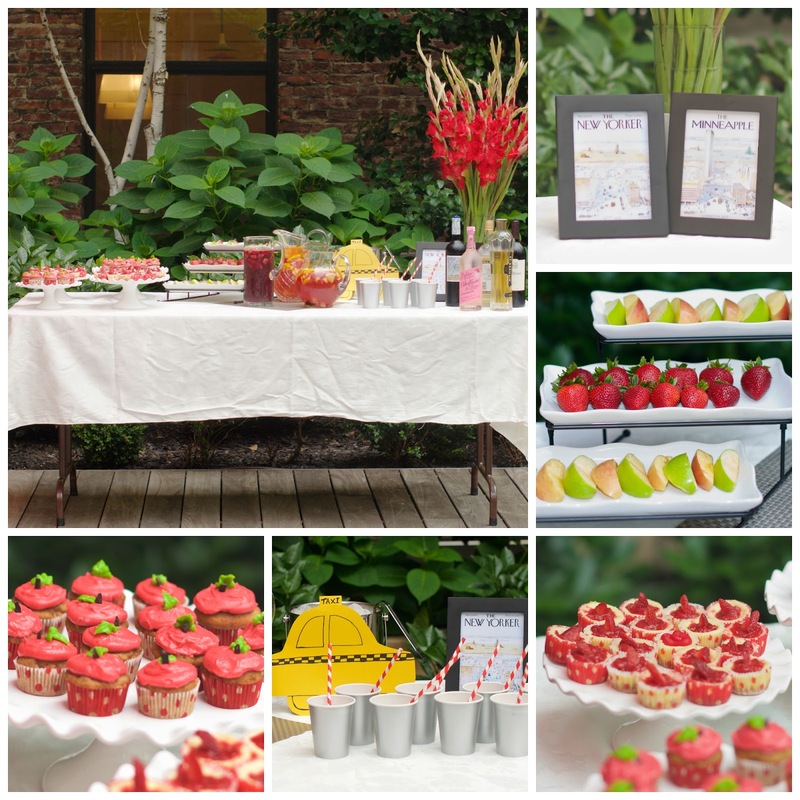 Guests also dined on fresh strawberries. We originally considered Apple Martinis for the specialty cocktail. But then we remembered, we don’t really like Apple Martinis. Michaella decided to serve light, refreshing sangria in red, white and rosé with apples instead. Guests sipped on these drinks with adorable red and white striped straws. Good luck Michaella and Matt in the Minneapple from all your friends in the Big Apple! Thanks for all the help putting it together! I always love a good collaboration – especially with good friends.